A dive computer by any other name, the Sea Instrument is a square and (sort of) attractive piece of kit for rich divers. 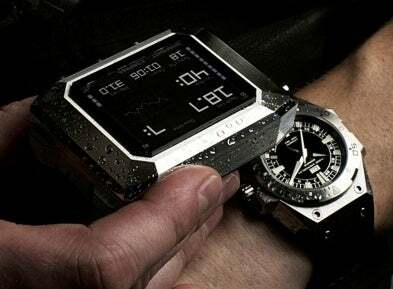 Launched this month by Danish watch designers Linde Werdelin, it clips onto the Biformeter watch and gives you all the info you need while you're blowing bubbles a hundred feet below the surface. So, it may be nice-looking, but is there anything there that would persuade me to get rid of my Suunto Mosquito, a snip at $300? • There's a full-color 220x176-pixel LCD screen—which I've got to admit is quite cool, but a bit redundant, given that the lower you go, the less colors you see. Good for impressing people in a bar though, as long as they're not divers, because they'll think you're a cretin. • It weighs 150 grams—and that's before you've even strapped the slightly fug-esque Biformeter to your wrist. • 128MB flash memory is useful if you have your dives computerized (surprise, mine are still on paper) and wireless-upgradeable software. • Internal temperature sensor, in-water sensor, light sensor. Yeah, nice features, but they're standard on loads of dive computers already. • Water-resistant to 1,000 meters. All very well, but do you honestly think I'm going to go down that far, given that I don't even use a wetsuit? • Rechargeable Li-Ion battery gives you five days on standby, 28 hours' non-stop diving. • Price is $3,000 for the steel version, and $46,000 if you want one in gold. Don't forget the only way the Sea Instrument works is if you clip it to the Biformeter, which costs $5,000.